New design & portfolio online! I’ve been working on a new site for a while now. This is the result. If you’re reading this via RSS, come check out the site and drop me a note on what you think! Most weight here has been put on usability, accessibility and readability. I wanted to keep everything really clean and spacious, to bring up the content, which of course is the most important part. I think it works pretty well. Everything should be valid and look the same in all major browsers. If you however find something that’s wrong, please tell me. All of the content from the old site is still here, just the layout has changed. Also all old permalinks are still valid, even if i changed the structure to a bit more logical one (so there’s no need to update your bookmarks). 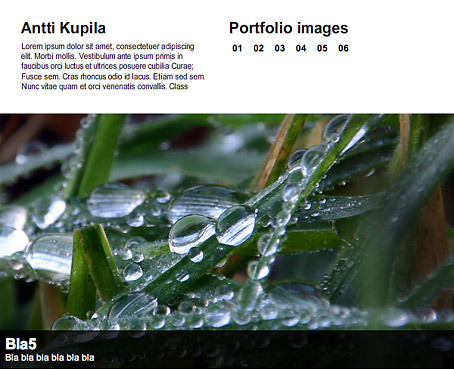 A portfolio section has also been added, although it’s not finished yet. I will be adding new items when I have the time. Try out the new, fresh, comment field! Tell me what you think! At Hyper we are now having a portfolio module, where we’re supposed to make our own portfolios. I guess this is more meant for those who normally wouldn’t put anything online, so .. they’re forced and they do it This is also planned in as a christmas holiday, when we don’t have any school projects going on, and can spend some time with our families and friends, which is of course nice. Anyway, the module. The whole day yesterday we enjoyed the company of Björn and Chris from Perfect Fools, talking about case studies, inspiration and other tips. I won’t go into detail (you’ll have to apply to Hyper yourself to experience it! ), but all in all it was a really nice lecture. Perfect Fools as a company has done some really impressive flash stuff (check out their portfolio! ), so most of us in Crew 12 got really inspired. Cool! Ok, so what to do with all this inspiration. I was asked to have a lecture and/or workshop in flash for the crew. It was really hard for me to plan it, since we obviously have pretty much all levels of flash knowledge and interest in the class. Anyway, I decided to take it full scale actionsript 2.0, focusing more on “how to think & plan” than “how to do” (= copy-paste for many, without understanding what they’re doing, hehe). Since we’re having the portfolio module, creating a portfolio base seemed pretty reasonable. So, that’s what we did. Note: All the photos used in this project are downloaded from http://www.sxc.hu, and are copyrighted to their respective owners. You may not use them for any purpose without contacting the owner. Go big or go home, as they say. I changed my webhost to Dreamhost, due to a growing need of webspace and bandwidth. I’m now getting 200gb hd and 2000gb traffic/month. What’s even better is that the hd grows with 1gb/week and the bandwidth with 16gb/week, for free! Sweet. I addition to this the web control panel is awesome, definetly liking it so far. Due to this change, I’ve been experiencing some minor technical problems (mostly due to own sloppyness). More or less everything should be ok now again. Update: There was a small error in the .htaccess, breaking some permalinks, fixed now. Sorry about this. This blog is featured on Light on dark, CSS mania, CSS Bloom, Most Inspired, The Daily Slurp and CSS Galleries (aggregated). Thanks! Finally got a new site online! Yay! Display. May be the wrong word, but what I mean is that i wasn’t able to display the info I wanted. This included some sort of an ‘about’ section, and more importantly the portfolio/showcase, where i now can have multiple images per item. 100% flash, with php/mysql backend via amfphp. Fully functional history, so that the user can use the browser’s back button, like on a normal HTML webpage. I can specify where the state is saved, and it can be turned off (entirely, or for certain links/areas). Could maybe add some sort of a control panel so that the user could decide?.. Trackbacks to every item, including all pages, and every item in the showcase (dynamically created, of course). This means that if you for example view an item in the showcase, you can send it’s trackback URI to a friend, and he’ll get to the correct item, just by pasting the URI in a browser. Easy, huh? Text size is adjustable. Again, like on a normal HTML page, either with ctrl +, ctrl – or with the mousewheel while holding down ctrl. The view > text-size menu won’t work, since, as far as I know, there’s no way to get that amount into flash. The text-size set by the user is saved in a cookie. RSS reader for this blog. Shows the up to 3 most recent entries’ excerpts. A whole bunch of other features I forgot / won’t mention. Check it out! Ok, sounding too much like a speech after getting an oscar, I’ll let you talk now. update: This site is now offline.